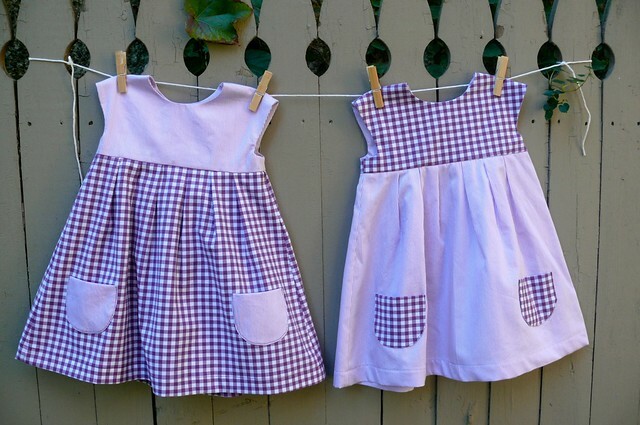 Home Children's	Better-Late-Than-Never Baby Dresses! Friends, I’m gonna let you in on one of my ugliest, dirtiest secrets. I hate sewing things for babies. I can feel the searing rays of your judgment! 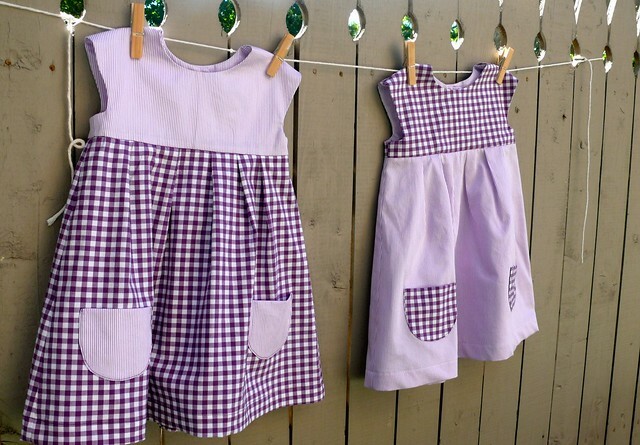 But let me explain– baby clothes are fiddly to make, fit for about 10 minutes, and never stay clean for very long. It’s a lot of work for very little payoff! Plus, many babies are showered with so many tiny outfits when they could probably use a big box of Pampers much more than another cardigan! But, when dearly-beloved friends have babies, even the grumpiest baby grinch is occasionally tempted to dabble in the world of tiny clothes, hence these little dresses. I knew that I wanted something pretty and sweet, but I didn’t want to go completely pastel for these dresses. I found a nice compromise in these beautiful 100% cotton shirtings from Mood Fabrics NYC. 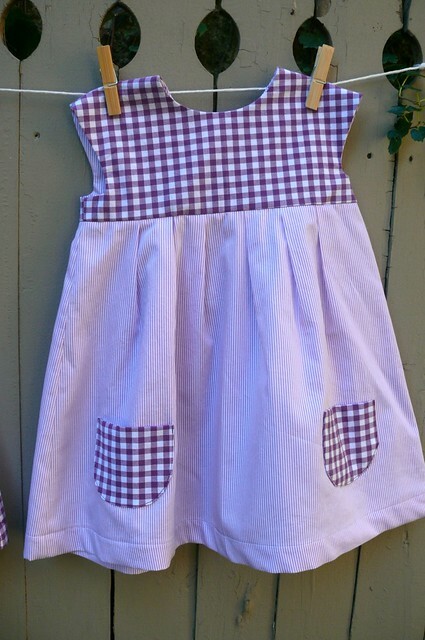 The combination of gingham and stripes is cute for a tot, and the fabrics are much more soft and luxurious than you usually see in children’s wear. Another benefit is that cotton shirting is tough enough to take a beating in the laundry. (Mood has a huge selection of checked shirtings here, and an even larger selection of striped ones here). Plus, it doesn’t take much to make garments this small, so you can get a little fancy with your fabric. I had just over half a yard of each fabric and was able to make two dresses. 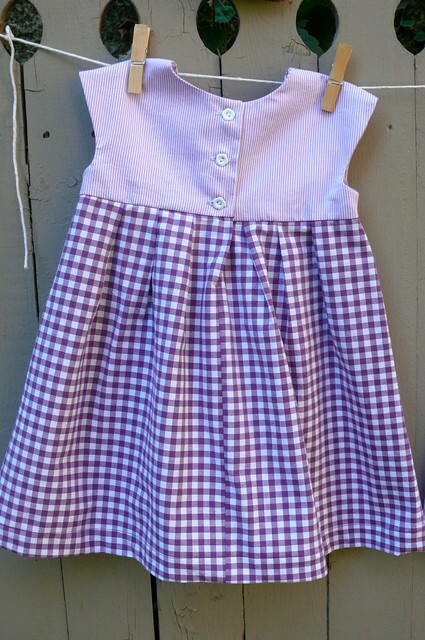 I used Made By Rae’s downloadable Geranium dress pattern, and chose the option with cut-on cap sleeves and a pleated skirt. The bodice is fully lined, and I turned and stitched the center back seam and used French seams on the sides (I’ve heard that serging can be too scratchy for sensitive baby skin). The bodice has a back button closure– not sure how easy this is to get babies in and out of. Any feedback, moms and dads? Although I wasn’t eager to make these, I found myself smiling as I stitched on the buttons and put the finishing touches on the dresses. 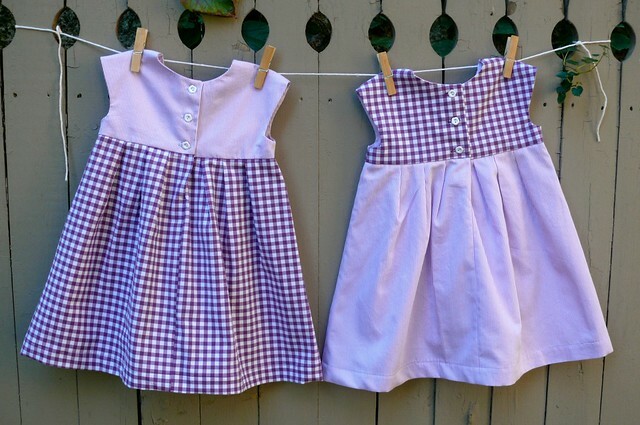 There’s just something so sweet about itty-bitty clothes! I really like how these turned out, and I caught myself planning future versions in blue, yellow, and gray combos. But before you think I’ve turned into Santa Claus overnight, you should probably know that I made these both in the 12-18 month size… because it’s been a while since these little girls were born. Better late than never, right? What’s your opinion of homemade baby gifts? A sweet potential heirloom? Better saved for older kids who are interested in what they wear? Tacky? Treasured? What’s the nicest handmade baby gift you’ve given or received?